I had an interesting meeting with a well-connected civil engineer on site here at Money Island yesterday afternoon. Hours earlier, I had a long telephone conversation with the Money Island project manager for The Nature Conservancy. Both conversations added valuable insights. More water is actually good for the future of aquaculture! It may not be good for roads, buildings or traditional infrastructure but we can certainly work around that with currently available construction modifications. Our core mission of providing public, industry and government access to local waterways will not be impaired by future water level rise. (I usually continue the conversation to discuss how Rutgers’ most recent forecasts of tidal impact and flooding trends for the next 30 to 50 years are built into our sustainability plan but don’t need to go into that detail here). Life is too short to fight the government. If I suspected that the retreat path was the opinion of state leadership, including NJDEP leadership, then I would change course. Life is too short to be in a battle against the prevailing force of government. But this is not the case. Every high-ranking official in NJDEP and state government that I’ve spoken with – probably more than two dozen by now – have all told me that they support the project and urge m to ‘stay the course’. Some warned me that the road will be difficult and that I will need to be persistent and ‘keep fighting’. Many of these government leaders have even given me pep talks to keep me going through this current struggle, pointing out how important this mission is to future generations. That’s what motivates me. That’s why I stick with the project. He agrees with the prevailing opinion that NJDEP should not be taking the current prosecutorial actions against marina infrastructure (our docks) that predate the beginning of permitting requirement laws in the 1970s. Granted, there are a lot of factual details that muddy the situation (historic photography, old land surveys, post-Sandy reconstruction law, etc.) but the core fact remains that our original marina and docks were built in the 1930s before land use permitting were required and therefore should be grandfathered to some extent. The usual first step in planning a project like this is called a pre-permit meeting with a wide range of stakeholders. He doesn’t understand why our requests for a meeting were declined. We discussed the thinking of certain department officials and how those have been addressed in other similar projects. His opinion, based on our exchange of bits of facts and third-party conversations, that our project does have the support of the most influential people who have been effective recently in getting the NJDEP to change their thinking about bayshore sustainability. We discussed the cost of this permitting and told me what I already knew: I would need to find a loan to cover the cost of land use permitting. we didn’t discuss that I’m already working on it or my frustration that the process is moving so slowly. Most of the infrastructure projects at the Money Island Marina community are developed and managed locally but funded through a combination of private and public funds. The most common funding formula is that we fund 100% of a project in advance and then the state uses federal funding to reimburse 75% of the approved costs. Since not all costs are refundable, it usually works out to something like a 50/50 split. We work with governments and other partners whenever possible to reach a level of cooperation that allows important projects to move forward. * These are 100% government controlled and funded, partially through EPA funds paid to the state. We will continue to communicate with our partners as well as federal and state agencies to try to keep these projects on track. However, if the funding offer from federal government is withdrawn, we will likely be stalled here for an uncertain time. 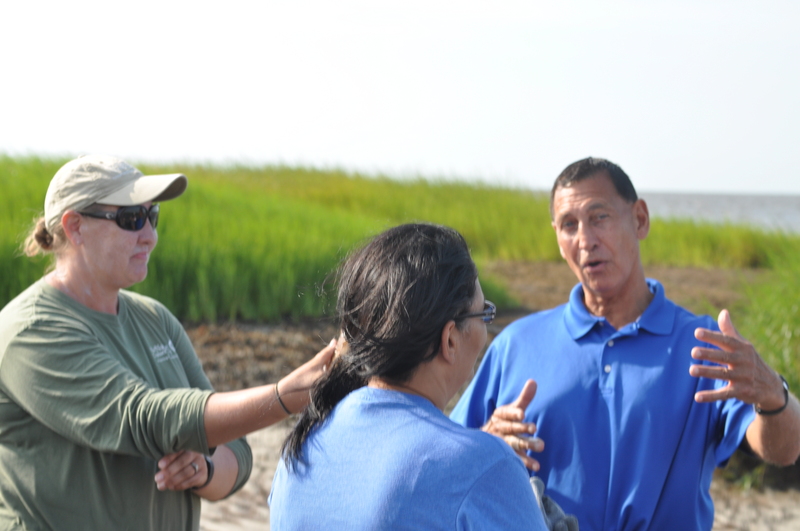 Congressman Frank LoBiondo has been a strong supporter of the Delaware Bay region, our environment and our businesses. This photo was taken on his recent visit to Money Island in August 2016 where he spoke about the difficulty in promoting our environmental interests in Washington. His efforts are largely responsible for the EPA-funded restoration projects here. This week NJ.com recognizes LoBiondo as one of only a few Republican leaders nationwide willing to stand up to the to repeal environmental restrictions on the coal industry. Earlier in 2016 the Congressmen met with me and a group of other concerned residents still fighting to settle Sandy insurance claims years after FEMA fraud admissions. I am grateful for Congressman LoBiondo’s efforts and feel blessed to have him represent us in Washington DC. I spent about an hour on Friday with a NJDEP official from the Bureau of Tidelands Management. There are vague stories that the prior owners of Money Island Marina did not pay the tidelands lease fees since the 1970s. What I do know is that when the prior owner emerged from the most recent bankruptcy, the NJDEP placed a lien on the properties. The language of the property lien makes it clear that it s due to actions (or inactions) of prior owners and not the current owner. We have been so busy with emergency Sandy repairs for the last four years (that are being worked out still), that I have had no time to work on it until now. We understand that there are three types of NJDEP violations and one open investigation on these properties. At this point, I have to start with just one of them. The immediate first goal is to quantify and begin the process of paying off the old tidelands lease fees. So I’ve spent a few hours this week beginning work on this project. The next step may involve a trip to Trenton for some in-person discussion. I will post again as BaySave makes progress.